Jonathan McCully was a participant at all three Confederation conferences, and did much to promote union through newspaper editorials. For his efforts, he received a Senate appointment. He later became a judge of the Nova Scotia Supreme Court. Jonathan McCully was born at his family's farm in Cumberland County, Nova Scotia, probably near Maccan. He attended local schools for a time before going to work on the family farm. From 1828 to 1830, he taught school (one of his pupils was Charles Tupper) in order to fund his legal studies. He was called to the Nova Scotia bar in 1837, and set up his practice in Amherst. He married Eliza Creed in 1842. A confirmed Liberal by 1837, he expressed his views in frequent contributions to the Acadian Recorder. His support of Joseph Howe during the 1847 election earned him an appointment to the Legislative Council. He held a variety of offices. In addition, he was a contributor to the Halifax Morning Chronicle, the major Liberal newspaper of the province. 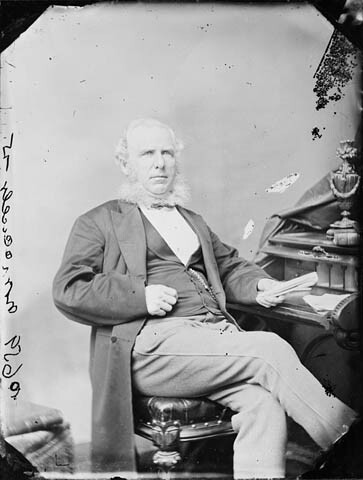 When the Liberals were re-elected in 1860, McCully was made solicitor general, as well as the sole railway commissioner. His policy of cost cutting over efficiency, and his lack of personal popularity, caused Howe to blame him for the 1863 Liberal election loss. Despite being the Liberal leader in the Legislative Council in 1864, McCully's name was not on the initial list of delegates to the Charlottetown Conference. However, when one of the other delegates withdrew at the last minute, Charles Tupper picked McCully as his replacement. McCully, not previously a strong supporter of union, was converted by the Charlottetown meeting. Although he made few contributions to the conferences at Charlottetown and Québec, he was an important promoter of union to Nova Scotians through editorials in the Morning Chronicle, and later the Unionist & Halifax Journal. After the passage of the union resolution in 1866, McCully eased this crusade. While he was a delegate to the London Conference, he again made few contributions to the proceedings. For his support of Confederation, McCully was appointed to the Senate of Canada in 1867. He was soon overshadowed by his more prominent colleagues Tupper, Adams George Archibald and eventually even Howe. He supported the "better terms" offered to Nova Scotia in 1869, but had little to do with Howe's entry into the Sir John A. Macdonald government. He was appointed puisne judge of the Nova Scotia Supreme Court in 1870. While his taste for efficiency was unpopular with lawyers, his personal popularity amongst Nova Scotians rose for the first time. He died at his home in Halifax, and was buried in that city at Camp Hill Cemetery. "McCully, Jonathan". Macmillan dictionary of Canadian biography. Ed. W. Stewart Wallace. 4th ed. Toronto: Macmillan of Canada, 1978. P. 490. Waite, P. B. "McCully, Jonathan". Dictionary of Canadian biography. Ed. Francess G. Halpenny. Toronto: University of Toronto Press, 1972. Vol. 10, p. 456-458.